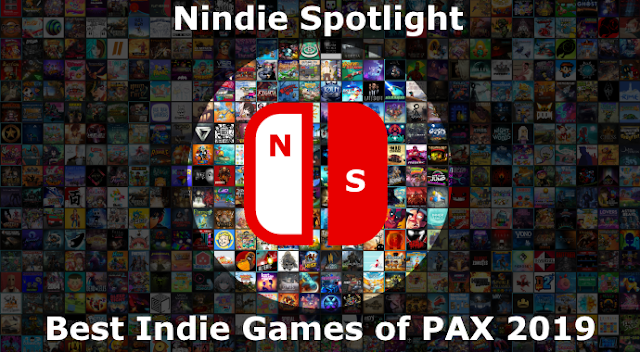 While survival games have been a pretty hot genre on the Switch they mostly tend to fall into one of two camps, ones where it’s more about strategy and resource management and then those that are more active and heavily crafting-oriented. What if I told you that there may be a different style that removes crafting and instead has more of a platforming focus? Would it still be a survival game or something else? 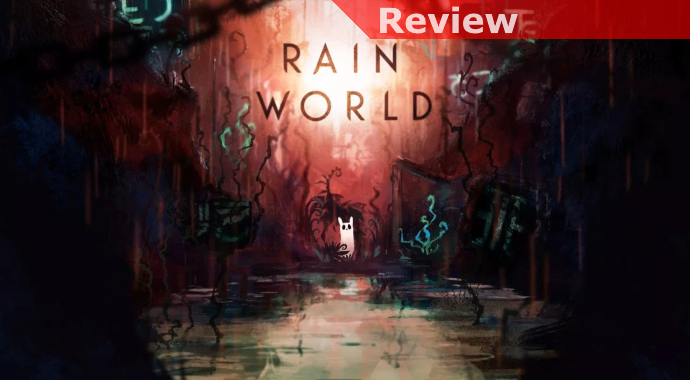 With that in mind I present you with Rain World, a title where you very much feel like you’re in a constant struggle to survive, but since you’re not a human and instead a somewhat cute and very malleable “slugcat” the rules of engagement are completely different. While there was a title called Shelter: Generations early on that also had you playing as an animal trying to survive for the most part this is a very fresh take on things. You’ve apparently been washed away from your family so your goal is to reunite with them, but that will take traversing a pretty run down and dangerous world full of various perils. Among these the most basic is simply the fear of starving, which is a very real concern as you’ll need to catch and eat the food that will sustain you, but there are going to be times when finding some food is going to take some doing on your part. Second, while you may not be at the bottom of the food chain you very much aren’t at the top either, and there are some quick and nasty predators about who’ll gladly make you their meal if you’re not quick, smart, and perhaps able to throw something at them to buy yourself time. 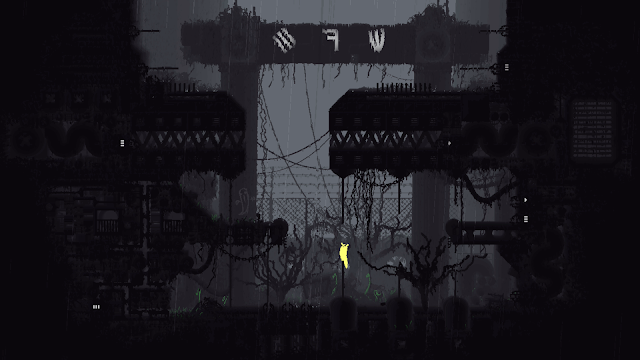 Finally, there are periodic rain events that are so intense that they’ll absolutely kill you if you’re unable to find a place to sleep, and have a full enough stomach as well. 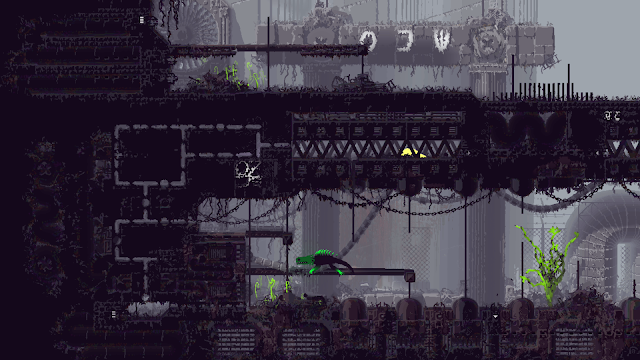 What will act as either the hook or the crippling element of the game is the platforming, which does take some getting used to. 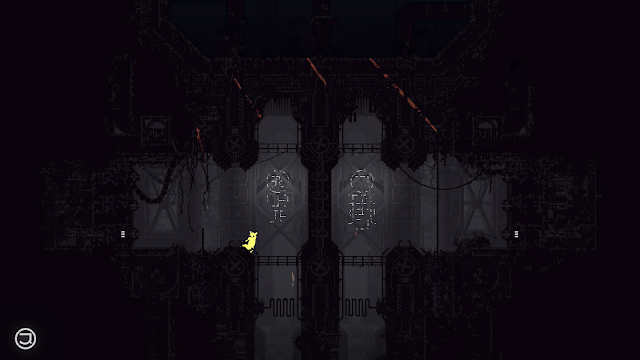 While your slugcat is able to cram itself into pipes to move between screens and various spots the controls can be a bit unwieldy at times, and that’s a bummer when you need to make a critical jump. Time and practice do help but there were times when I felt like I should definitely have been able to grab onto a ledge or a pipe and lost pretty significant progress with a nasty fall. There are odd sort of indicators on the screen that will try to give you some indication of where you’ll want to go but it’s all a bit relative, and you’ll likely want and need to do some exploration to understand where certain areas are like those that tend to have food… you’ll need it. Progress can be slow and pokey, patience and understanding will go a long way towards better assuring enjoyment, this isn’t a game you’ll jump into and find immediate success, it’s much more likely a slow burn of building skills and understanding through consistent failures.